London has many a plus point and cultural experiences coming out of its ears – not to mention great food, people and parks. Yet in the run up to Christmas I often find myself mentally transported somewhere far up north in the Highlands (or Narnia?) surrounded by Fir tree forests, icicles and open log fires. If, like Meatloaf, you believe two out of three ain’t bad, then the Christmas Maze in Vauxhall this month could go some way to indulging your little Christmas wonderland fantasies. Okay, so Vauxhall isn’t well known for its magical Christmas vibes, but like many areas in London, its making use of its heritage and breathing new life into its communal spaces. Reviving its name previously used in 1859, the Vauxhall Pleasure Garden has become a leisure space enjoying music, festivals and events all year round. 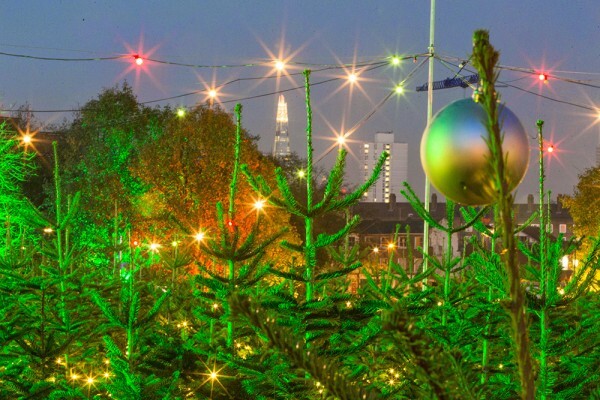 Bringing a forest into London is no mean feat but the organisers have managed to arrange a 500 square metre section in a maze-like fashion for you to escape and quite possibly lose yourself (temporarily) amongst the smell of the twinkling Christmas trees.